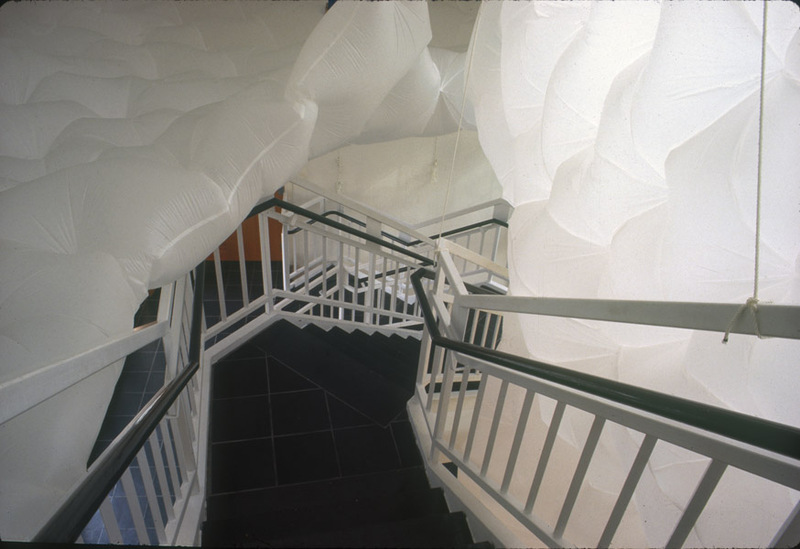 Cake Walk , 1998, nylon parachute fabric, blower, steel, wood, rope, hardware. The entry lobby of the Aldrich Museum, added to the structure in 1994, reads as an architecture that bridges the gap between the old section of the museum (originally a post-colonial war building) and the new wing, which functions as modern white cube gallery. The exterior of the new section stylistically mirrors the original facade, but the disparity between the intimate galleries found inside the old building and the large open and stark showplaces of the addition is striking. Though it suits the many purposes and faces the museum wears to have two very different types of spaces, the intricate, open, and endlessly complex lobby space lacks a more intimate moment in the journey from old to new. My first impulse was to figure out a way to make sense out of the complexity and simplify the visual experience. The staircase as a linear structure illogically severs the space, creating a jarring visual effect that clashes with the simple “house” shape and grid structure of the sash windows. As I studied the staircase I realized it is not only an obstacle in the openness of the space, but also that it frames small intimate views of the ceiling as I peer up the open sections. I was baffled by the unusual location of the skylight, which seems to make no sense with the rest of the structure. In the archives of the Museum I discovered that there was formerly a balcony that would have been directly under the skylight. Cake Walk covers the pitched ceiling with an inflated drop ceiling, a continuous surface in reaction to the disjointed and fragmented space. The light coming in through the solitary skylight is trapped above this surface and diffused gently into the glass walled space. Acting as a sort of architectural archaeologist, the skylight called me to uncover a layer in the history of the structure that can serve to clarify, and simplify one’s understanding of the entry lobby. Rebuilding the balcony invests the skylight into the history, in that it can provide a little glimpse of the original view of the sky from the balcony. 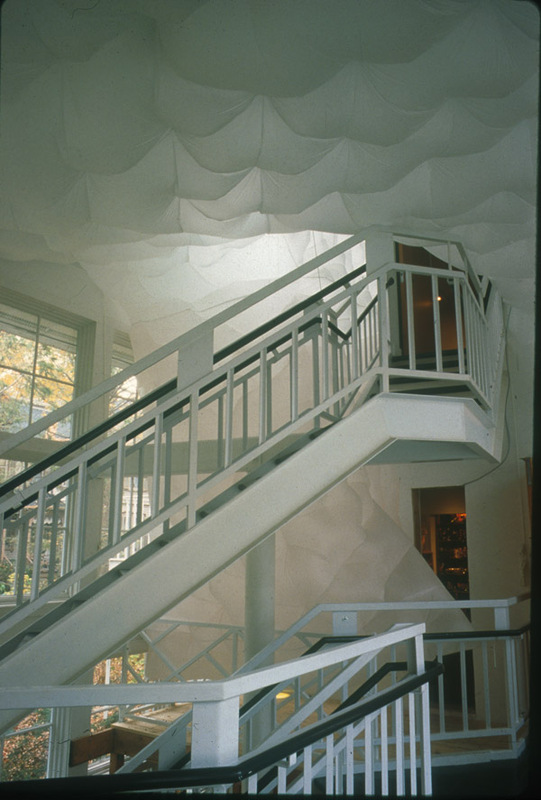 From the reconstruction of the balcony, one can look up and through an inflated “view tube”, an appendage of the inflated ceiling, see the sky above. 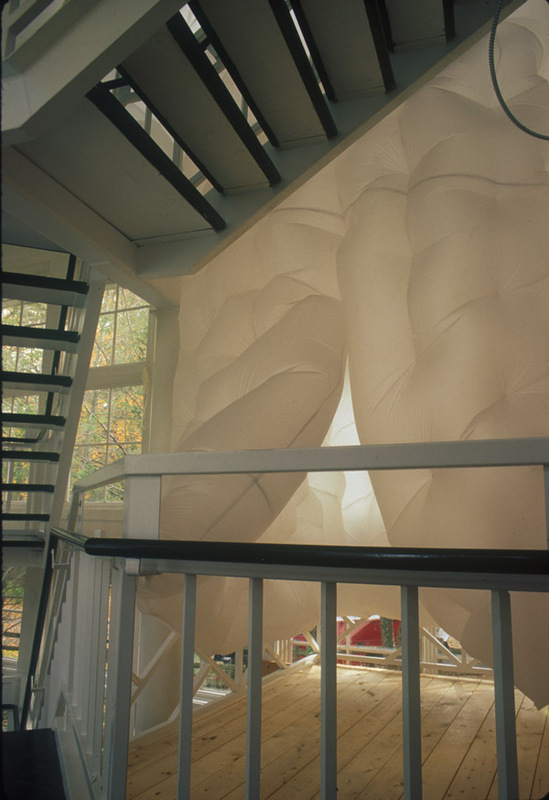 I chose to use the inflated fabric structure both for its ability to act as an insulative layer and to collect and diffuse the ambient light of the space. 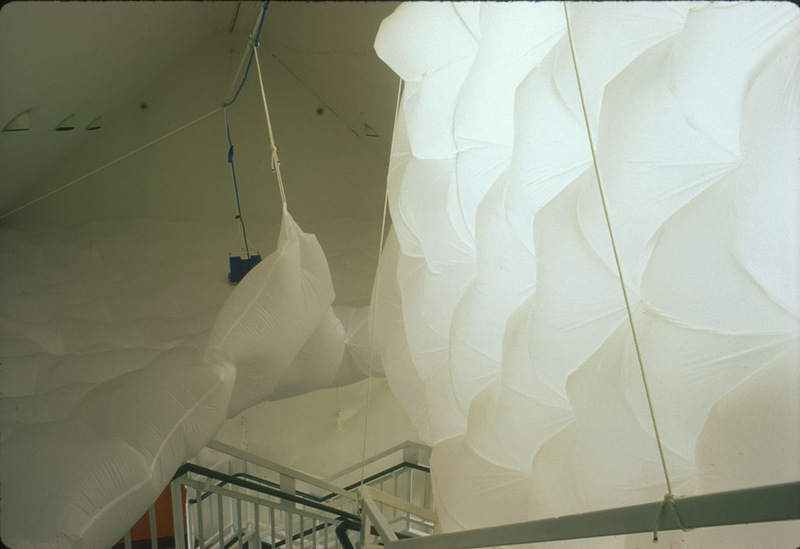 The transluscent nylon envelope functions as a sort of parenthetical divider within the space, isolating and distributing the air and light. 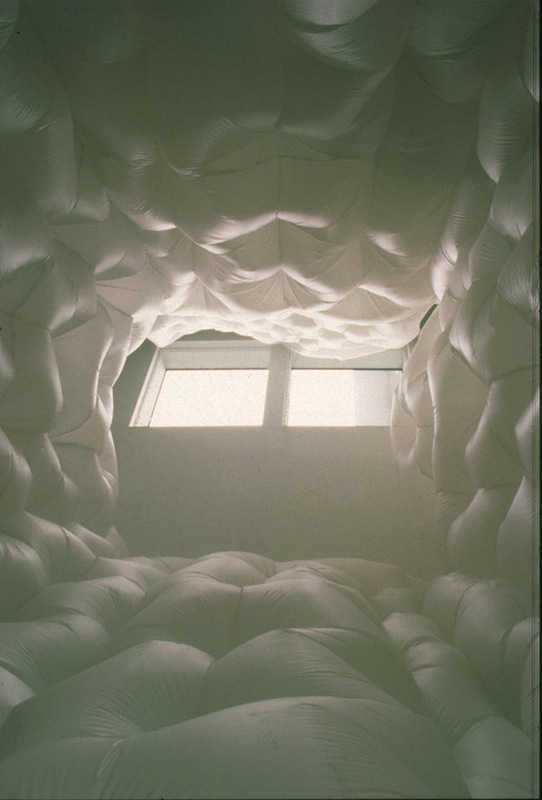 While architecture is one layer that insulates culture from nature, this work forms a second layer that insulates us from the architecture forming a more intimate surrounding. This layer takes the form of an undulating, reactive, fleshy, wall that immediately contrasts the environment that supports it.